Today (June 4th) I am starting a 30-day vegan challenge as a sort of temporary health experiment. For the record, this isn't about losing weight, fitting into a bikini or crash dieting. In fact, this is about getting some clarity and exploring how this whole diet change could impact my wellbeing in another way. For those of you who may need some explanation, a vegan diet is one that is entirely plant-based. Meaning that you cannot consume any animal, or any animal by-product, such as milk or even honey. It's the most intense version of vegetarianism: no meat, no dairy, no eggs, and no honey, honey. A friend of mine here in Dallas was explaining to me how she initially went on a vegan diet as something she did for Lent. She ended up feeling so incredible by the end of her temporary veganism stint that she continued on the diet voluntarily and she is now a fully committed vegan. My interest was piqued. Are the changes that significant? Can it really make you give up meat and cheese because you feel that fabulous all the way around? I needed to know. And I also can't imagine wanting to pass up meat and cheese (and honey and eggs!) in lieu of something tofu or veggie-based. Don't get me wrong I love my salads and I'm a huge fan of tofu. And actually, if I think about my diet on a day-to-day basis, I am pretty veggie forward to begin with. I would say most of my meals lean in a vegetarian direction, although I weave meat and eggs in regularly. I also tend to limit my dairy intake already. But. I am a Midwest girl born-and-raised and not only are meat and dairy flat-out some of my favorite things, but agriculture is a huge part of where I am from. Cattle and dairy farmers are part of an industry that I have always been proud to support. Not to mention that farm-fresh eggs are the best thing in the entire world. So I am certainly giving these things up with a bit of a hesitant tinge. Seriously, no eggs? Seriously, no dairy? Seriously, I have to say goodbye to my weekly brunch cheeseburger? Honey? No more breakfast sandwiches?! However, considering my friend's beaming endorsement, I am determined to try this out and give it up for 30 days if it's really going to make me feel as great as all of the research suggests. Besides, 30 days isn't a lifetime. I figured it was long enough that I could really see some effects and decide whether or not it was something I'd like to realistically continue. This is the not-so-short reason why I started this whole endeavor in the fist place and I am interested to see if it will make a difference. I am optimistic, but I’m also not looking to over complicate my life so we’ll see where the cost-benefit analysis ends up on this thing. So without further ado! See below for my experience as a temporary, 30-day vegan. Day 2: So far, so good. I ran to the grocery store today and made a massive haul of veggies, fruit and all the healthy niche foods you could think of. I tried to stay away from processed vegan food such as frozen meat substitutes for now because I don't love the idea of chemicals and fillers in my food but we'll see how this diet goes! Also. I ordered a glass of Pinot Grigio thinking that all wine is vegan. I was wrong. Is anyone else shocked by this??! Apparently there are trace amounts of animal products such as fish bladders (not as gross as it sounds upon further research), honey or sea shells, introduced into certain steps of the fermenting phase. So I unintentionally broke my vegan challenge with my wine but I found a website moving forward that determines which wine (and beer for that matter) is vegan-friendly. If you're interested in taking a look, here it is: Barnivore. Day 11: Finally tried kombucha for the first time. For some reason I had been avoiding trying it because the fizzy vinegar-y thing always threw me. I was so wrong...that stuff is soooo good. I've read a few articles that suggest to regularly take a probiotic if you adopt a vegan diet because it can cause candida overgrowth. The probiotic regulates this and keeps your gut healthy and on track. I also successfully did a full day of airport travel and a business dinner while maintaining my plant-based challenge. Feeling very accomplished! Day 12: I completely broke my vegan challenge today. We had a work lunch at a barbecue spot - let me tell you that there was seriously not one option on the menu that was entirely plant-based, even with modifications. I didn't sweat it too much though - life happens - and enjoyed my day off. The BBQ meal segwayed into an incredible homestyle dinner with the best spinach artichoke dip I think I ever had. No regrets. Day 13: Travel day to Illinois for a week of work at Springfield's HQ. This day was by far the hardest. I got stuck for 12 hours due to travel delays, and after having been re-routed and delayed over four times, this day was kind of a wash although I tried to eat vegan as best as I could. Fun fact: the original Chex Mix is vegan. Day 16: Feeling really great, but also starting to get tired of eating the same things all the time. I decide to look up some unique vegan recipes to mix it up. Breakfast: toast with almond milk cream cheese and jam, or a green smoothie and paired with an almond milk latte (if I'm working from a coffee shop) or a black coffee with coconut milk creamer (if I'm working from home). Lunch: Salad loaded up with veggies, avocado, dressing - basically anything at a salad bar that qualifies as vegan so I feel full! I've also been making hummus wraps with the Boca buffalo "chicken" patties (actually some form of tofu), roasted veggies and having a side of avocado and tomato salad. I know I originally said I wanted to stay away from processed vegan options, but by day 18 I'm willing to give in to mix up my food! Snack: Carrots and celery with hummus or peanut butter, or fruit such as pineapple, watermelon or grapes. Dinner: Usually some version of a Buddha bowl: a grain like couscous, brown rice, or farro mixed with some combo of roasted veggies like sweet potato, tomatoes, carrots, peppers, onions, mushrooms, topped with lettuce, a 1/4 of an avocado, hummus or marinara sauce, and sprinkled with sunflower seeds or toasted almonds. These have been so, so good but it's become my default and I'm getting bored with my food. Day 19: I attempt a Pinterest recipe of vegan/paleo/gluten-free peanut butter chocolate protein balls. Cooking within these new limitations is kind of fun and provides an interesting challenge. Day 20: OMG where has this vegan kale pesto been all my lifeeeee. I have officially found my favorite thing to eat as a temporary vegan: sliced purple potatoes topped kale pesto and mashed avocado. I will continue to eat this even when I'm not doing this challenge. Day 21: Also jackpot: found this other amazing vegan thing -- snickerdoodle Dō Bites by Better Bites Bakery. I will continue to buy these too! Great for a sweet craving. Day 23: I am finding it super easy to eat vegan throughout the week, but it's mind-boggling to attempt over a weekend where you're being social. I have struggled through three different menus and most restaurants only offer vegan appetizers, or vegetarian options that you have to further customize to make entirely vegan. It's annoying. It's beyond clear at this point that really committing to the vegan thing would become an battle of willpower at every social gathering. While I completely understand that people are totally capable of doing this, I don't know if I'm noticing enough differences in how I feel or look at this point to warrant such extremes. Day 24: Okay, I can officially say it now: I'm kind of over this. And I really, really want a grilled chicken wrap. Day 25: I'm trying to really analyze how I'm feeling on this vegan diet compared to how I felt on my normal diet before. Truth be told, other than feeling satisfied that I'm accomplishing a 30-day goal, I don't feel any different -- mentally, physically, emotionally or otherwise. I'm very interested to know if other people have had a similar experience. 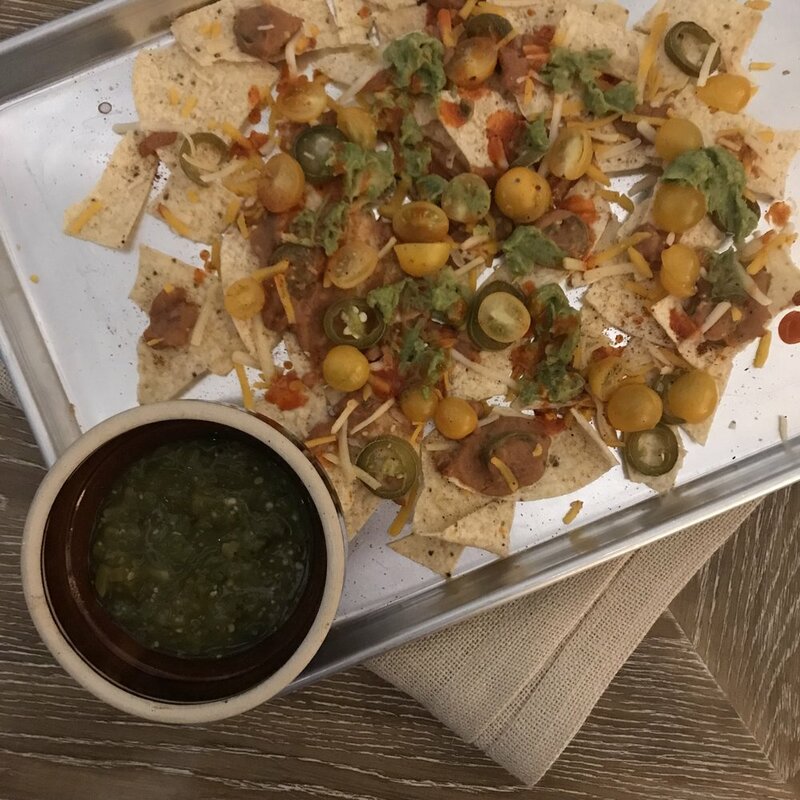 Day 27: Vegan nachos have become my go-to staple and I have some version of them at least every other day! #TexMexAddict In reality if you stick to a single serving of chips, beans, and cashew cheese isn't that bad for you! Plus I'd deck it out in cayenne, salsa and all.of.the.spices to satisfy my daily craving of spicy food. Day 29: Tomorrow I'm traveling for the 4th of July holiday so it's crunch time - gotta stick to my goal, I'm almost done! Day 30: I.AM.DONE. And just in time for the Fourth of July! Well, let's see here. What are my conclusions? Well...interestingly enough. I don't feel very different. I loved that I was holding myself accountable to a new challenge, but outside of that everything seemed to remain pretty much the same. I slept pretty well, I had energy - but not more than I already do, I still felt the level of stress that is normal for me, and I didn't notice anything regularity-related if you know what I mean! Everything was very much the same. I've been thinking about this long and hard and the only thing I can think of is that maybe I eat pretty vegan-ish to begin with?? (Although I still find that hard to believe because it's not like I stick to a regimented diet. In fact, I don't follow any particular guidelines at all except finding some happy medium between what I feel my body needs and what I'd really like to eat.) I already use coconut milk creamer, for example, and I already have a salad regularly for lunch. But I have meat almost daily (my guess is that about 4 out of 7 days of the week I have meat) , and breakfast sandwiches are one of my favorite foods. Maybe if you're a snack food junkie or if you have to force yourself to eat veggies or something this might be a huge change for you? Your guess is as good as mine! Or maybe my expectations were set so high that I was expecting to be more shocked. Basically I can't figure it out. I would love to know if anyone else has had a similar underwhelming experience! As further proof, after 4th of July I went back to eating normally -- so naturally I ate cheese and cheeseburgers. Right on cue, I have a zit forming on my chin and another that is threatening to emerge along my brows. But could it also be from sweat during our lake trip over the 4th of July? Or an overabundance of sunscreen? Maybe! As you might be able to tell, my conclusion is that I certainly don't feel different enough to continue my vegan ways. I completely understand and believe that there may be certain people who respond extremely well to it. My suggestion to anyone who is interested in a vegan diet is to at least try it. You might discover all of the wonderful benefits it bestowed upon my friend! I've noticed that I feel my best when I've been eating as whole and as unprocessed as possible. I don't hold that as a rule because I have chips and salsa almost every day and I eat bread or cereal every morning for breakfast. But I don't love the idea of cutting out an entire food group whether it's meat, dairy, or even carbs. For me personally, I think it's all about just limiting these over-processed options and listening to your body.